The Guangzhou BRT runs along one of the busiest corridors in the city and carries 800,000 passengers each day. Photo via ITDP. The 8th Annual Sustainable Transport Award, created by the Institute for Transportation & Development Policy, is given annually to the city that made most progress over the year to increase mobility for all residents while reducing transportation greenhouse and air pollution emissions and improving safety and access for cyclists and pedestrians. The awards are presented in January in Washington, D.C. This year there is also a category for “Enduring Commitment to Sustainable Transportation.” EMBARQ, the producer of this blog, is one of the members of the Steering Committee. 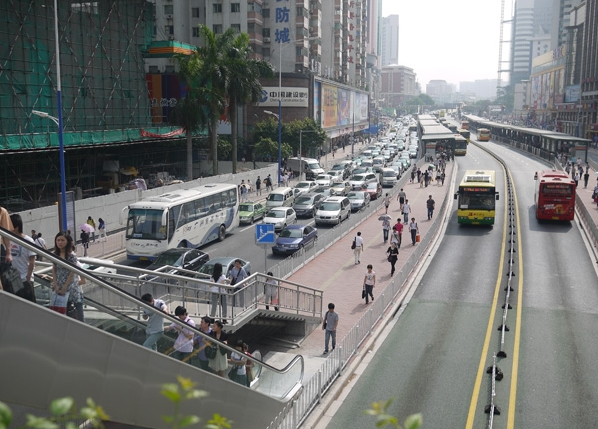 Guangzhou, China (2011): Guangzhou’s new world-class BRT system integrates with bike lanes, bike share and metro stations, raising the bar for all cities. Ahmedabad, India (2010): In only a few months of operation, Ahmedabad’s Janmarg BRT transformed transit in South Asia and became a model for the future of transportation in India and the world. New York City, United States (2009): New York City demonstrated that political will, bold leadership and citizen engagement can lead to sweeping transportation reforms. Paris, France & London, United Kingdom (2008): Paris revolutionized bike sharing with its individualized mass transit system called Vélib (“Freedom Bikes”). London is the largest city to adopt congestion pricing and its success has inspired cities around the globe. Guayaquil, Ecuador (2007): The Metrovia bus rapid transit system opened its first 15 kilometers (9.3 miles) in 2007. Seoul, South Korea (2006): Under the leadership of Mayor Myung Bak Lee, a four-mile elevated highway that once covered the Cheonggyecheon River in the city center was replaced with a riverfront park, high quality walkways, and public squares. Bogota, Colombia (2005): The TransMilenio BRT integrated bicycle infrastructure with mass transit, redefining and reclaiming public space for its citizens. The final nominees are chosen by a Steering Committee that includes experts and organizations working internationally on sustainable transportation.